The Skill Will matrix is used to identify the person’s combination of skill level and willingness to accomplish a specific task. Knowledge of a person’s skill and will levels can assist you in creating a plan of action to help them to achieve the desired results. Will is an individual’s desire to complete a particular task based on attitude, incentives, confidence, and personal feelings about completing the task. People have many different motivations for completing a task. Some may do it for money, others for recognition, and others may just do it for personal satisfaction. Skill is an individual’s capability or proficiency to complete a specific task. People have different skill levels when it comes to completing a specific task. People’s level of skill can often depend on their experience and familiarity with the task, training, understanding, or natural abilities. People’s skill and will levels vary depending on several different factors. By plotting an individual’s levels along a scale from low to high can help you determine what techniques you can employ to manage that individual to success. The goal is to help the person attain both a high skill level and a high will level. There may be several different reasons why a person lacks the necessary skills or the will to perform a task. Step one: Determine his or her skill level. Determine if he or she has experience, training, and/or knowledge. By assessing a person’s skill and will, you are able to plot them on a graph. One dimension is skill, the other is will. A person may really want to accomplish a specific task, but unfortunately he or she may not have the knowledge or training to do so. 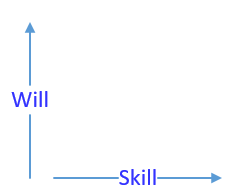 On the other axis is a person’s willingness or desire to perform a particular task. A person may be extremely skilled at a task, but lack the motivation to complete it. Based on the assessment of an individual’s skills and willingness to perform, you can choose how to best manage or coach him or her towards success. 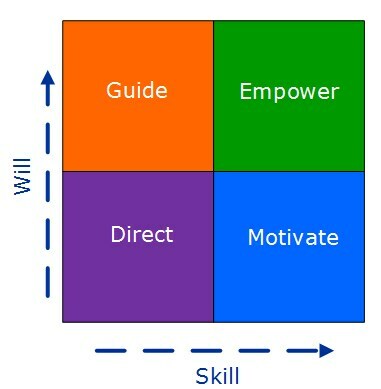 The basic Skill Will matrix is divided into quadrants. 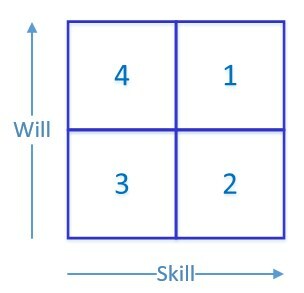 Depending on the combination of ability and willingness to perform a task, individuals fall in one of the quadrants on the matrix. Some Skill Will models will have more than four divisions. Depending on where they fall on the graph, a person will fall within one of four categories. Shining Star – a person who has both skill and will to perform the task. This is often an experienced person who is looking for more opportunities to grow and develop new skills. Novice – a person who has the desire to complete the task, but lacks the necessary skills. Typically this is a person new to a particular task who is enthusiastic, but lacks the skills or knowledge needed. Coaster – a person who has the skill and ability, but not the will or motivation to complete the task. This is often a skilled, experienced person who may have hit a plateau and needs a new challenge. Problem Child – a person who has neither the skill set nor the will to complete the task. This is often a person who has started a new task that they did not desire. However, this may also be a beginner to a task who has low confidence and who is afraid to fail. The Skill Will Matrix is a guide to choosing the best management or coaching style to guide others to success. 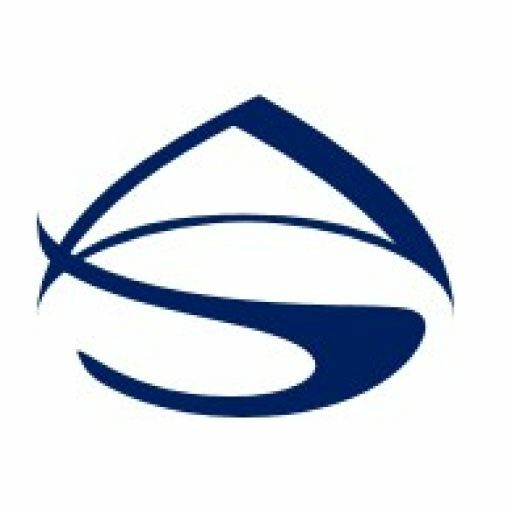 The matrix allows you to understand different types of individuals and apply specific techniques that help them perform better. The matrix helps you match a person’s combination of skill level and willingness to four different management or coaching styles. The goal of this style is to empower and stretch them. This group has the necessary skills, so find opportunities to help him or her grow and develop more skills. With this style, take advantage of his or her motivation and invest time early on in building their skills. Provide the proper training and create a risk-free environment to allow for learning. When dealing with this group, identify the reason(s) for his or her low motivation, and find incentives to motivate him or her. Create both intrinsic and extrinsic motivations and incentives. With this group, you will need to build both skill and will. First, identify the reason(s) for the low motivation. Foster his or her desire to complete the task before building skill sets by creating both intrinsic and extrinsic motivations. Then provide the proper training and support.